Many people have ideas for improving upon common items. Most of which turn out to be slightly silly, think of the products sold on late night infomercials. However, the team at NativeCast came up with an idea that is far from silly. They make planters that are traditionally made of wood, ceramic or resin out of concrete. Remember the feeling you used to get as a kid the night before leaving on family vacation? The excitement bubbling up uncontrollably within you, the minutes stretching on to feel like hours, and the feeling that morning would never come. 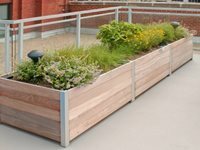 These planters were met with the same excitement and anticipation by landscape designers around the country. Invented by a son who wanted to help his mom in her garden, the Ultimate Plant Cage is a fully adjustable plant support. “She drug me out to her garden as a kid and had me working out there, as I got older I saw that her plants were falling over and getting damaged,” says Mike Donaldson. To solve the problem Donaldson invented a cage that was better than the cheap metal or bamboo ones we are familiar with. If you’ve ever watched a group of children learning to swim it’s clear that floating comes more easily to some than others. One child will effortlessly rest on the surface of the water, while another will struggle to stay afloat. With enough practice and acclamation to the water, most kids eventually master the art of floating. All you Glee fans out there know there’s nothing better than a well-sung mashup - two awesome songs becoming one even more awesome performance. While you may not want to admit it, they’re pretty catchy. Here’s a mashup you don’t have to be embarrassed of, the City Planter by Potted. 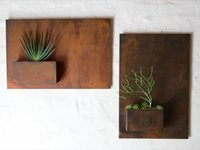 These wall planters hold plants and act as artwork. Spilling wine or dropping your plate of appetizers is never a good thing. Often at outdoor parties we find ourselves struggling to balance both a plate and a glass in our hands. Sometimes we set our drinks atop a wall, or hand them off to a friend while we sneak a bite. 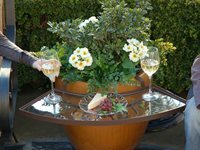 The LEDGE, a wrought iron table that attaches to garden pots, offers a simple, elegant and affordable solution to this problem. Named America's Cleanest City in 2008, Miami is on the cutting edge of sustainability. They have top notch air quality, parks, drinking water and recycling programs. It comes as no surprise then that an innovative company like DeepStream Designs calls this city home. 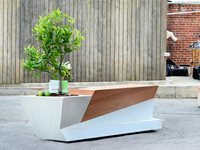 Perfect for an urban garden, this multipurpose bench and planter has a stylish design and is eco-friendly. It is made from lightweight concrete and reclaimed Douglas fir. 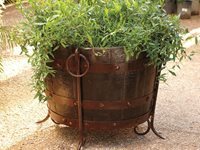 With the desire to be environmentally friendly stronger than ever many people are looking for ways to use reclaimed materials in the garden. 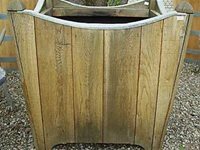 There are a variety of salvaged and attractive planters available for use outdoors. Capital Garden Products' line of square planters and troughs have a timeless design. Made of fiberglass, they are light weight and durable, but have the appearance of weathered lead or aged terra cotta. Any of the various styles would look wonderful in a formal or English style garden. When ordering be sure to request drainage holes, as they are not standard. 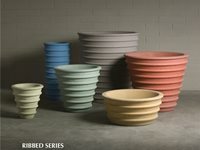 The Ribbed Series Landscape Containers from Kornegay Design will add a unique element to any patio, deck, balcony or garden. 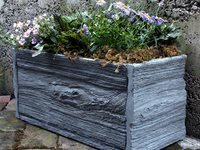 Available in a variety of sizes, shapes and colors these concrete planters will blend with any garden style or theme. 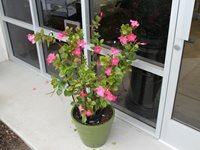 They can be used to create a distinctive container garden by grouping multiple planters of varying sizes and colors. 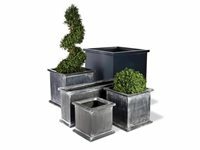 Because they are made of durable cast concrete, the planters will last outdoors for many years. 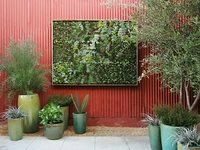 Vertical gardens are showing up everywhere! 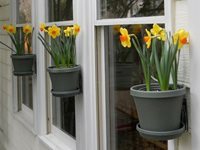 You can order Vertical Garden D.I.Y. Panels online from San Francisco-based Flora Grubb Gardens. Each panel is a 20" x 20" tray containing 45 slanted planting cells that support plants and soil. The panels are designed to mount easily to any flush wall. 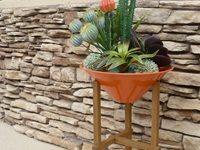 To get a look like the image combine multiple panels, plant small succulents, and frame the entire arrangement with wood.